While pregnant with our last baby, we were in the midst of building a new home, selling our old home, and living with in-laws in between. That yearning to nest was replaced with packing and dreaming. We closed on our home on a Friday, moved in on Saturday, and baby came the next day, Sunday. 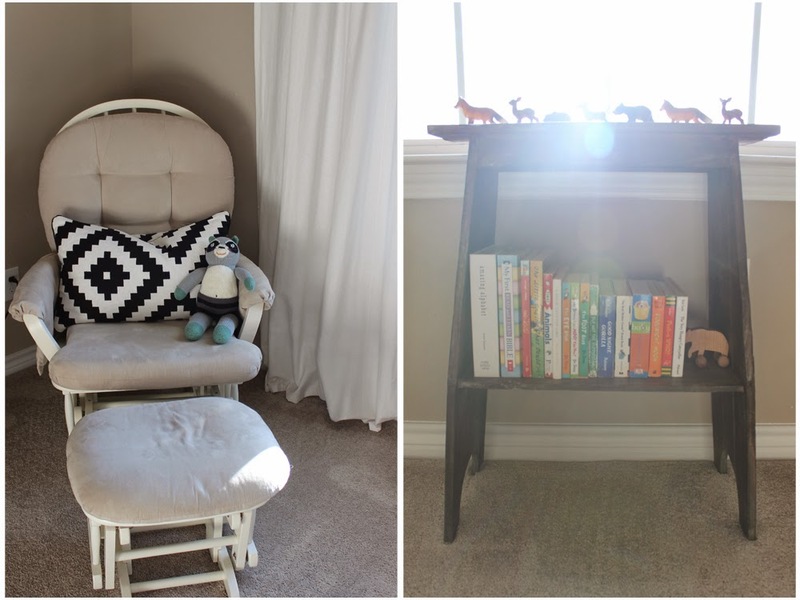 The last thing I wanted to do after just having a baby, and readjusting to having a newborn schedule, was unpack and decorate, yet all I wanted was to feel settled and at home. It was a balance I was trying to figure out. 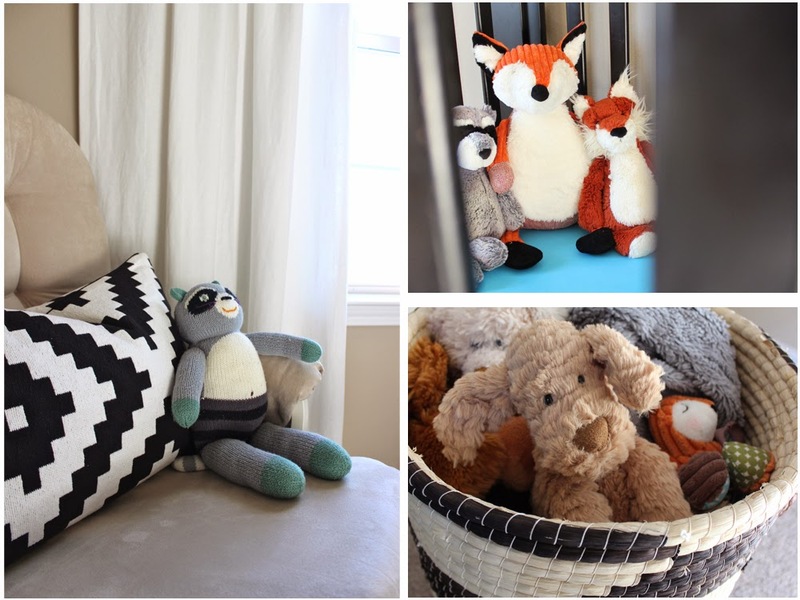 Eventually, things came together, and it is now one of my favorite rooms in the house- not necessarily because it is the most decorated, but because of the sentiment behind the room. 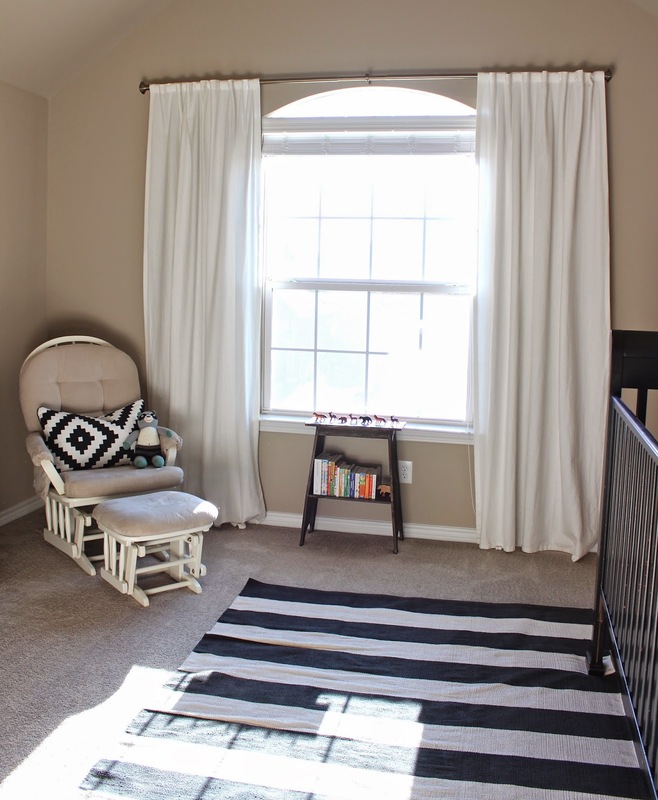 This was our last baby, thus, this is the last nursery. The last crib, the last rocker . . . 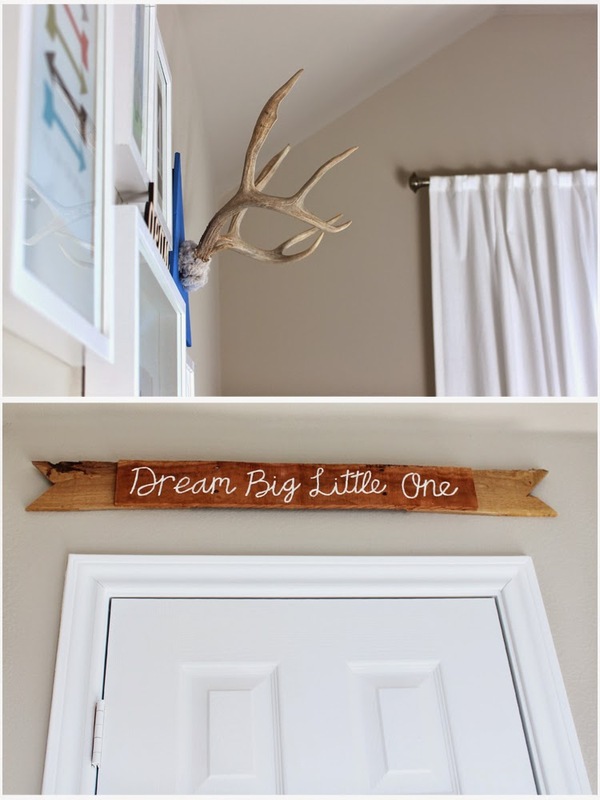 So every time I walk in the room, I take in the details, the tiny elements, the sweetness. I just laid my baby (okay, he's 21 months, but he will always be my baby) down for a nap. Placing his heavy body down in his crib, I am realizing that these baby moments are fleeting. 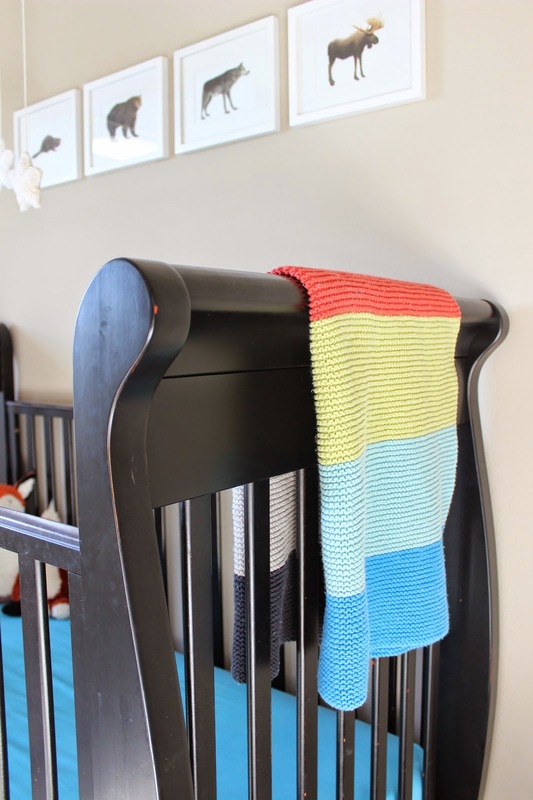 That the transition to a big boy room is pending, though I joke that I may keep him in a crib until he is FIVE! 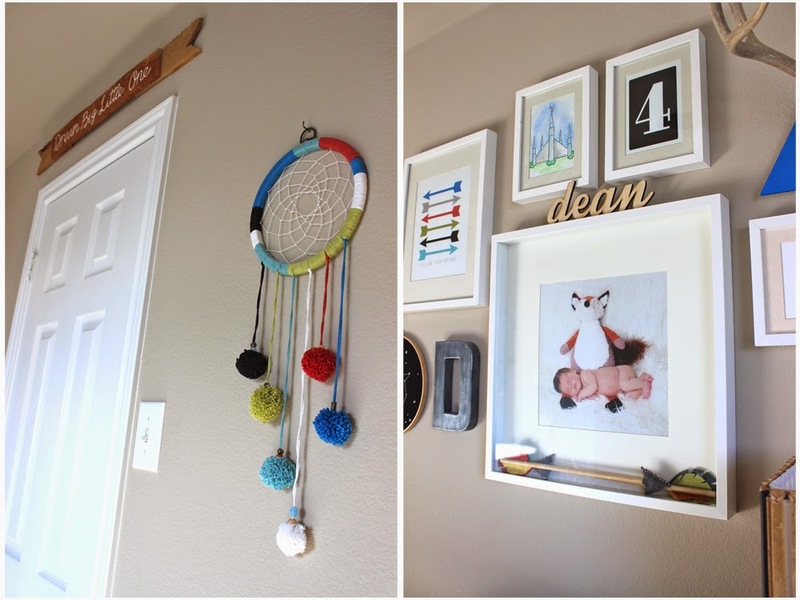 I've already started accumulating items for his big boy room, but for now I want to cherish the nursery. There are scatterings of mountain and woodland animals throughout the room- miniatures, stuffies, prints . . .
My mom always makes each new grand baby a blanket. 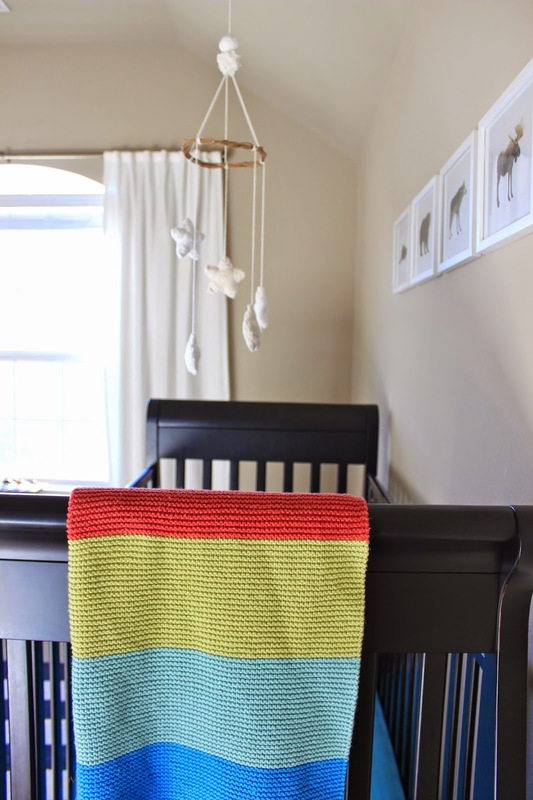 I knew I wanted a striped blanket like one I saw on The Purl Bee. We picked out colors and my mom remastered her knitting skills and made my babe this fun, modern, and super soft blanket. It is definitely a treasure. The art prints above the crib came from The Caravan Shoppe. Super easy to buy, download, then print. Instant gratification! The rest of the art and wall decor was made by yours truly. Digital designs, an embroidered fox constellation, faux pewter initial, photos, and even some fun felt arrows. My dad had some antlers laying around, and I asked if his grandson could inherit them- he can't say no to his grand babies! I wanted a playful modern take on an antler mount so I cut a triangle and painted it bright blue for the background. Some scrap pallet wood I had leftover from another project got repurposed into a wall banner. 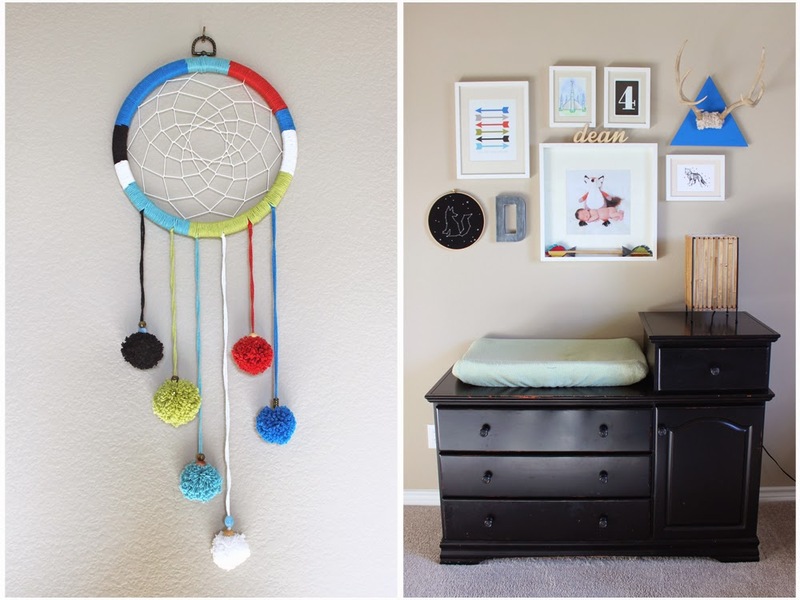 That along with the dreamcatcher were my wishes for sweet dreams for our little one. The dreamcatcher was made using left over yarn from the blanket my mom knit. Sitting rocking my baby, during the day with the sun pouring in, or in the wee hours of the night, were treasured this time around especially. For his first birthday, my dad made some wood cuts. His name was on top of his cake, and later added to his collage wall because I couldn't part with it. The mobile was a labor of love while I was pregnant. 10 crochet little stars in white and natural yarn, later joined, stuffed, and hung from a ring of twigs gathered from our yard. Every night as I put him to bed we sing Twinkle, Twinkle Little Star as I make the stars dance above him. He loves it, and I cherish those moments.